Timor concerns: An INTERFET patrol extracted from the mountainous East Timor border region transports an extra passenger to the care of the field hospital in Dili. A soldier shields the child’s father from the wind as he cradles his young baby, suspected to be suffering from malaria. Photo: Defence Images. 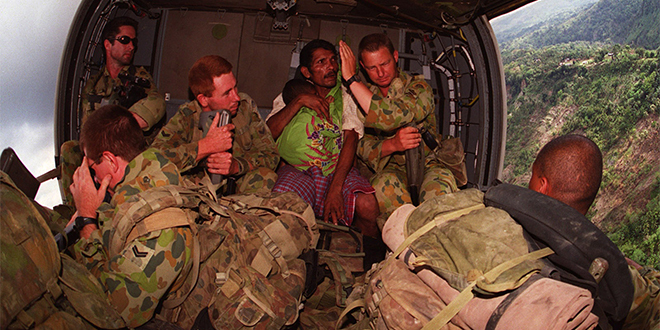 Timor concerns: An INTERFET patrol extracted from the mountainous East Timor border region transports an extra passenger to the care of the field hospital in Dili. A soldier shields the child’s father from the wind as he cradles his young baby, suspected to be suffering from malaria. VETERAN Nick Hodge admitted feeling trepidation as he prepared to return to Timor Leste. “(It’s) going back to places that weren’t that nice. I’ve been up and down, gone off the rails, but it’s something I want to do,” he said. Mr Hodge, a veteran of multiple deployments with both the army and the Australian Federal Police, is one of the hundreds of Australian soldiers who, on returning home, found himself haunted by post-traumatic stress disorder. Now living on the Sunshine Coast, he is one of 27 Aussie vets on an 11-day visit to East Timor as part of a unique rehabilitation program with spirituality at its core. The 12-month program, called Timor Awakening, is taking aim at a “health crisis” amongst young Australian veterans who suffer from a frightening suicide rate. According to the Queensland-based charity Walking Wounded, since 1999, 263 veterans have taken their own lives. During the Timor Leste trip the Australian vets will visit sites of historical wartime interest, and team up with Timorese veterans and their families. A highlight of the trip will be a pre-dawn ascent of Timor’s highest mountain, Mt Ramelau, to experience the dawn and have a service of healing and new beginnings. “It will be a chance to leave the past and darkness behind and embracing a future of life, love and hope,” Deacon Gary Stone, president of the Veterans Care Association, which set up the Timor Awakening program, said. Deacon Stone is chaplain to the ex-service community in Brisbane archdiocese. “This is the awakening we all desire, but find so elusive in day-to-day life in Australia,” he said. RSL Queensland is funding the Timor Awakening program, which will provide holistic health care for 200 Australian veterans. “This has all come about because RSL Queensland wanted to give veterans a more comprehensive rehabilitation program,” Deacon Stone said. “There are various hospital programs available, but not a 12-month immersion experience like this, with the support of doctors, psychologists and chaplains – all veterans themselves. Mr Hodge said he believed VCA’s holistic approach was helping to rebuild his troubled life. “Psychiatry and sitting in a hospital has its place, but when you are physically, mentally and spiritually broken Veteran Care is a gold nugget,” he said. They have tailored this event to cater for everyone, with no discrimination. “Faith and hope can come as an individual awareness, but as a group it is much more powerful,” Mr Hodge said. Former nurse Wendy Taylor, from Brisbane’s Everton Hills, is another participant returning to Timor Leste. She served in the First Gulf War and in Timor Leste was senior nursing operator at the United Nations-run military hospital. Ms Taylor left the military in 2005 after climbing to the rank of Lieutenant Colonel. “Personally I am apprehensive things might get opened up. As a nurse dealing with the injuries – mainly civilian injuries – it was hard to contend with,” she said before her departure from Brisbane. “I am going back to see how things have improved. I am looking forward to seeing how the civilian hospital has developed. “I remember head injuries from people falling off overloaded buses and trucks, and the cerebral malaria, especially its effects on women. “Pregnant women – not all of them survived. It put a lot of stress on me as a nurse. The trip back to Timor Leste is meant to be a circuit breaker to prepare participants for a period of nine months follow-up support by VCA staff. For some, it will mean living out new and healthier lifestyles. Timor Awakening also aims to promote and support the rehabilitation of East Timorese veterans from trauma and the complexity of living in the new, but impoverished nation of Timor Leste. Readers can follow the progress of the Timor journey on the Timor Awakening Facebook page.